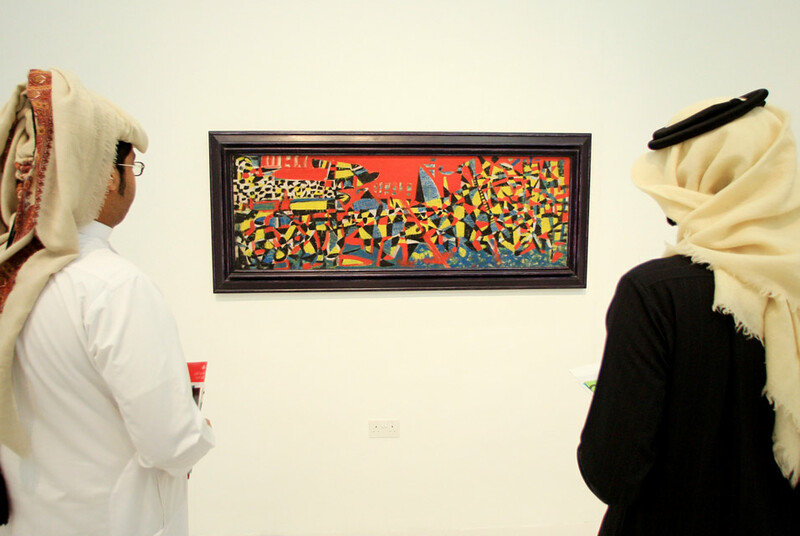 Visitors look at a painting by Fahrenissa Zeid at the Mathaf: Arab Museum of Modern Art in Doha December 30, 2010. REUTERS/Mohammed Dabbous. DOHA.- For its inauguration, Mathaf presents three exhibitions featuring historic works of Arab modernism and many newly commissioned works, which will be on view at two sites in Doha, Qatar. Mathaf opens its new building with Sajjil: A Century of Modern Art, the first in an ongoing series of exhibitions that will survey its unparalleled permanent collection, on view from December 30, 2010 (closing date to be announced). Sajjil, an Arabic word meaning the art of recording, features more than 240 paintings, sculptures and mixed-media works made by more than 100 artists, representing pivotal moments in the development of Arab modernism throughout the 20th century. Arranged thematically across twelve galleries, the historical exhibition makes its own contribution to rethinking the position of Arab artists toward modernism and within the modernist movement. The exhibition is organized by guest curator and consultant Dr. Nada Shabout, Associate Professor of Art History and Director of the Contemporary Arab and Muslim Cultural Studies Institute at the University of North Texas; Wassan Al-Khudhairi; and Deena Chalabi, Mathafs Head of Strategy. Mathaf will present the additional two inaugural exhibitions Interventions and Told / Untold / Retold at the Qatar Museum Authoritys new exhibition space located on the grounds of the Museum of Islamic Art. Interventions: a dialogue between the modern and the contemporary (December 30, 2010  May 28, 2011) honors the lives and careers of five major figures in Arab modernism who remain influential today. Dia Azzawi, Farid Belkahia, Ahmed Nawar, Ibrahim el-Salahi and Hassan Sharif have each been commissioned by Mathaf to create a new work, which will be shown in the context of existing works by the artists from the Museums permanent collection. The exhibition is curated by Dr. Nada Shabout. The most ambitious museum exhibition of contemporary art in the Arab world to date, Told / Untold / Retold: 23 stories of journeys through time and space (December 30, 2010  May 28, 2011) features new works commissioned by Mathaf from 23 contemporary artists with roots in the Arab world. The exhibition is a collection of 23 stories each vividly expressed in new works of painting, sculpture, photography, video, multimedia installations and interactive digital art. The featured artists are Adel Abidin, Sadik Kwaish Alfraji, Buthayna Ali, Ahmed Alsoudani, Ghada Amer, Kader Attia, Lara Baladi, Wafaa Bilal, Abdelkader Benchamma, Mounir Fatmi, Lamia Joreige, Amal Kenawy, Jeffar Khaldi, Hassan Khan, Youssef Nabil, Walid Raad, Khalil Rabah, Younès Rahmoun, Steve Sabella, Marwan Sahmarani, Zineb Sedira, Khaled Takreti, and Akram Zaatari. The exhibition is curated by Sam Bardaouil and Till Fellrath, co-founders of Art Reoriented, a curatorial platform focusing on contemporary art from the Middle East. Ohio Auction House Launches Facebook Application: "beGifted by Garth's"
Anecdotes, Art Quiz, Education, Mythology, 3D Images, Last Week, . Editor & Publisher:Jose Villarreal - Consultant: Ignacio Villarreal Jr.
Dear User, please complete the form below in order to recommend the Artdaily newsletter to someone you know. Please complete all fields marked *.